Techland has plans to celebrate the summer with a variety of weekend events throughout July and August. The first event is already underway and the second event is planned for next weekend. 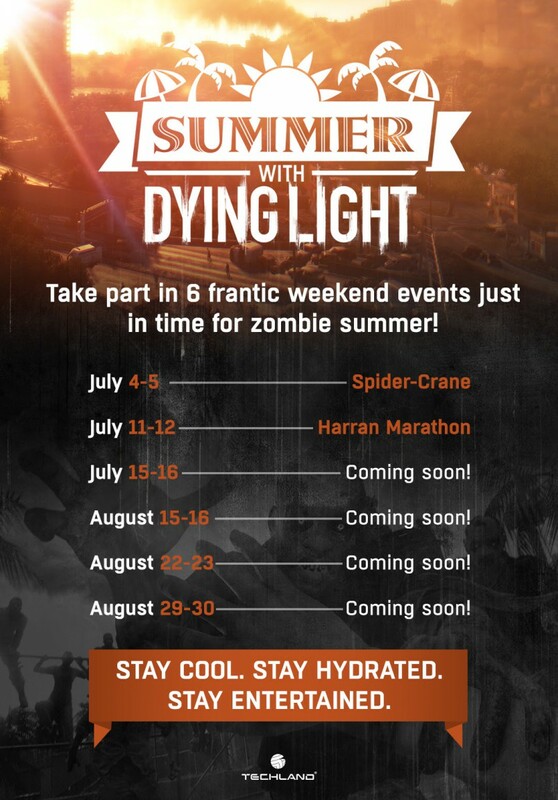 Those who enjoy Dying Light will likely like it even more with the new summer events. VG 24/7 picked up the news where the announcement about the new events were highlighted on a poster that shows the dates for each of the weekend activities for Techland's Dying Light. The first event gets underway this weekend, it basically makes it where you have infinite amounts of grapple hooks and no fall damage. Quite naturally this means you can go around reenacting your favorite Spider-Man moments. You can see the full schedule for the events below. The Spider-Crane event only lasts over the July 4th Independence Day weekend, with the event ending on the 5th. The next event, set to take place between July 11th and July 12th is known as the Harran Marathon. I'm not entirely sure what sort of stipulation this adds to the game and what sort of extra gameplay conditions are thrown into the mix, but we'll likely find out closer to the start of the event. Following the Harran Marathon, Techland has surprises in store for the events that take place from July 15th to the 16th, as well as August 15th to 16th, the event between August 22nd and 23rd and finally the event taking place between August 29th and 30th. Techland has been doing a lot of post-launch support for Dying Light following the game's release way back in January. They released some DLC for the game throughout its tenure on the market and even decided to support the modding community for the game on PC by releasing developer tools for the game. The modding scene isn't quite as bustling for Dying Light as games like Team Fortress 2 or Counter-Strike: Global Offense but it is picking up some steam. Heck, even Techland decided to help spotlight some of the works of the community by doing a video to highlight some of the top 10 mods available for Dying Light. The game itself is an open-world title with a heavy focus on traversing the environments using parkour and acrobatics. There's also a lot of melee combat that makes up for the core of Dying Light's mechanics. The game aims to give gamers a satisfying feel of weapons with weight and mass when connecting with the zombies, making it a rare first-person experience where the gore and violence really pops. If you already own a copy of Dying Light and you want to enjoy the benefits of the new weekend events, be sure to boot the game up and start enjoying the fun-filled holiday weekend events. Alternatively, if you need to learn more about the game you can do so by paying a visit to the official website.